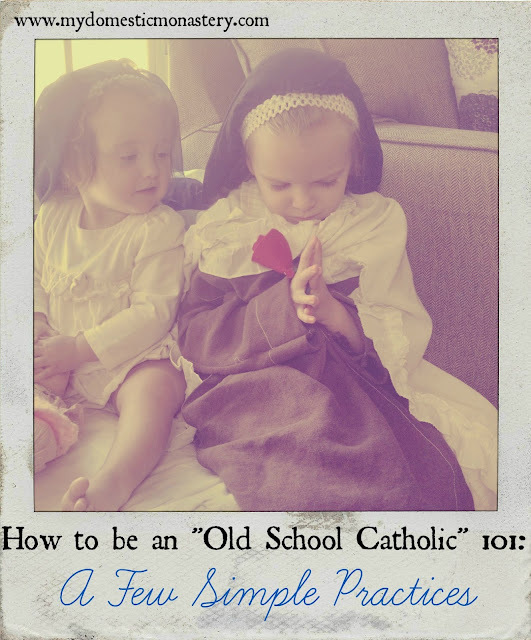 This post is the final part in a mini-series called "Old School Catholicism 101." Just for fun, we'll be spending this weekend looking at some of the "Old School" aspects of our faith culture, and why they're worth a try. Join us? If you're struggling to find a way to insert prayer throughout your day, I highly suggest the Angelus. I like the Angelus because you're given the words and the times of day to pray it. If you're wanting to start with just one time, many people pray the Angelus at noon every day. (The other day the girls and I were at a playdate at the house of one of my best friends. She's trying to get in the habit of praying the Angelus every day at noon, so she has an alarm set on her phone. Unfortunately, the Angelus coincided with clean-up and lunch prep, so our six kids were making a ton of noise in the dining room, while I cleaned up in the kitchen and she in the living room, and we shouted the responses of the Angelus back and forth to each other. It was hilarious.) If you're wanting to have the prayer printed out and hung up in your house, Kendra of Catholic All Year has a beautiful printable for you. Making the Sign of the Cross as you pass a church. Andrew and I have fallen into this practice because of...Maria. I teach the girls to blow kisses to Jesus in the Eucharist, and occasionally remember to do so when we're passing a church with Jesus in the Eucharist. Maria almost never forgets, and I'm often driving somewhere, super distracted, and I'll hear this little voice in the backseat, "Hi, Jee! Mmmm-mwah!" (Of course, Maria doesn't discriminate, and will do this anytime we pass a building that even vaguely resembles a church.) I like blowing kisses at Jesus, but I thought it might be nice to start making the Sign of the Cross as I pass a Catholic church, since that is a practice that most everyone used to do back in the day, and it's easily recognizable. It's a small but visible way to witness to my belief in the Eucharist. I super heart novenas. I'm basically in love with the saints, and I think we on earth are like little brothers and sisters in faith to them. I think that the novena to St. Joseph is the one that Andrew and I have prayed the most, but we also love the novena to St. Therese. One of our other favorites is the novena to the Holy Spirit, and we usually pray it leading up to the Baptism of a new child of ours. Novenas are wonderful because they give you a means of praying in a focuses way for something, for nine days in a row, and they often couple you with a saint friend who can pray with you. Perfect. Receiving Communion on the Tongue. In some ways, the common practice of today - receiving Communion in the hand - is more old school. The practice was referred to as far back as St. Cyril of Jerusalem, who instructed his flock to "make of [their] hands a throne" for Christ. It is certainly a beautiful practice, especially when done in keeping with St. Cyril's imagery! But also old school is the practice of receiving Communion on the tongue. I've practiced both in different stages of my life, and I think that both can be beautiful. Other than the fact that receiving on the tongue is more convenient when you're juggling a baby or toddler in your arms, I also think it's beautiful because it's an opportunity to be nurtured yourself. The imagery that I've heard for this practice is that when we receive on the tongue, we are allowing ourselves to be fed, like a small child. Actually, the comparison that I've heard is that it's like a baby bird is fed. Have you ever had a nest of baby birds on your window sill? When they get hungry, they feebly lift their little beaks up, and just wait like that until their mama comes back with food for them. They just trust that she will come back. They are so small, so vulnerable, but they know that they will be cared for and fed. That's how it is when we come to receive Jesus in the Eucharist - we are so little, so helpless, but we can trust fully that He will provide. This one is difficult, because we live in a time and culture where so much is scheduled on Sundays! Now, there are certainly instances where working on Sunday is unavoidable. There are many professions that require it (such as doctors, nurses, etc.) and there are other people who are in positions where they are working a job they have to work in order to make money for their families...and their job makes them work on Sundays. (Some jobs will give you wiggle room, so take it if you can! But some definitely don't.) So, that disclaimer aside, resting on Sunday is all about the mentality. It's about taking a day to pray, attend Mass, but also to re-charge your batteries for the week ahead. It is charitable to avoid making unnecessary purchases on Sundays, so that you create less work for others. But it's also important not to be scrupulous about that (guilty as charged) and to focus on how you can best embody the spirit of rest on Sundays. What feeds you and your family? What do you all enjoy doing? Is it something you can do on Sundays together? Praying before meals no matter where you are. Andrew and I both grew up in families that prayed regularly before meals, but when we were dating and engaged, he suggested that we try praying before meals in public places. I felt so self-conscious at first, but in time I realized that is a really beautiful and easy way to witness to our faith wherever we go. It also reminds other people to pray before meals. I know that I often forget if I'm not with someone else there to remind me! Okay, just had to include a fun one. But seriously? Donut Sundays are awesome. It's fun to spend time with your family, maybe chat with some other parishioners and your priest(s), and eat a donut or sip some coffee. Good times had by all. Do you have any other practices you'd suggest? Sometimes I have to get a little loosey-goosey with my Angelus and pray it during the noon hour. We always prayed it before our midday Mass when I was in college (which is when I learned it), so when Mass shifted to 12:30 during finals to accommodate the exam time slots, we prayed it at about 12:28. No biggie. I've stuck with that, praying before I eat lunch at work even if I eat at 12:30 (or 11:30, or 1). I am with you on making the Sign of the Cross when passing churches! I also say a Hail Mary when I pass "adult" establishments and PP "clinics." I have been vague so as not to pollute your blog, but I think you know what I mean. These are beautiful thoughts Michele! I loved the imagery of being nourished ourselves. I too have started the tradition of making the sign of the cross as we pass a church. Lovely reminders!